Travel with expert historians on all of our historical and WWII tours! Stephen Ambrose Historical Tours carries on the legacy of our founder, Stephen E. Ambrose, America’s premier historian. We offer a rich array of historical, WWII, WWI, Civil War and D-Day tours that are based on Dr. Ambrose’s research and led by full-time historians, who are leaders in their field and world-renowned authors. Like Stephen Ambrose, we enlighten, entertain, and educate with our tours. 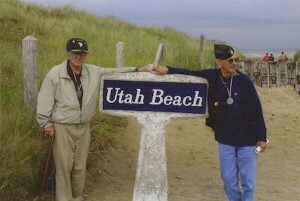 We visit Omaha Beach with D-Day veterans to pay homage to the fallen, follow in the path of Lewis and Clark down the Missouri River, and tromp the battlefields of the Civil War. When you travel with Stephen Ambrose Historical Tours you will learn about the opening of the great American West, the American Civil War, WWII, WWI and D-Day from expert historians, who travel with you throughout the entire tour. No other historical, WWII or D-Day tour company offers our unparalleled historical experience. May 29 - June 13, 2019 - 75th Anniversary of D-Day: Churchill’s London to Battle of the Bulge Waitlist only. Tour: May 30 - June 13, 2019 - 75th Anniversary of D-Day & Patton’s 3rd Army Waitlist only. Operation Overlord 75th Anniversary Tour - 75th Anniversary of D-Day: Operation Overlord Waitlist only. June 2019 - 75th Anniversary of D-Day: D-Day to the Rhine Waitlist only. June 1 - 13, 2019 - 75th Anniversary of D-Day: Normandy to the Rhine Waitlist only. August 8 - 19, 2019 - Scotland: Jacobite Rising of 1745 Call for availability. March 2020 Waitlist Only - Iwo Jima Tour: War in the Pacific Waitlist only. Please contact us. There may be openings.